The Choir of Clare College, Cambridge is a mixed-voice choir whose primary function is to lead services in Clare College's chapel at the University of Cambridge in Cambridge, England. Since the founding of the choir in 1971, the Choir of Clare College has gained an international reputation as one of the leading university choral groups in the world. The first chapel choir was formed in 1866. For the next one hundred years the choir consisted of undergraduate lower voices and a treble line provided by boys from city schools. In 1966, the use of boys was discontinued and for a brief period there was no upper line. The current mixed-voice choir was established in 1971 by Peter Dennison, a music fellow of the college. He was succeeded by the college's first director of music, John Rutter. Rutter left in 1979 to focus on composing but retains a close connection with the college as an honorary fellow. Timothy Brown directed the choir for 31 years until he was succeeded by the choir's current director of music, Graham Ross. The choir normally consists of between 25 and 30 singers, most of whom are undergraduates at Clare College, Cambridge. In addition to the choral scholars, who are obliged to remain in the choir throughout their undergraduate studies, the choir includes some volunteer members who are often studying at other colleges as well as a lay clerk and a choir administrator (who sings in the choir). The organ is played by two organ scholars, who, like the choral scholars, are students (typically undergraduates) at the college. An organ scholarship is awarded as necessary to ensure that there are always two undergraduate organists in the college - a new scholar is appointed to arrive when the previous one graduates. If the director of music is not present for any reason, an organ scholar takes responsibility for conducting the choir. 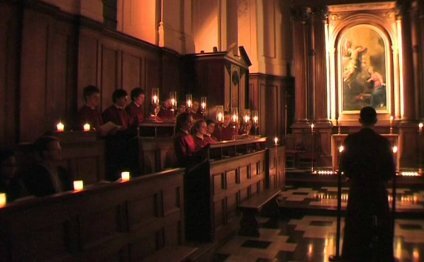 The Choir of Clare College, Cambridge maintains a strong recording and touring schedule, in addition to its performances at Clare College Chapel in Cambridge. In recent years, the choir has toured throughout Europe, the US, the Middle East Australia and Asia. The choir regularly performs in the United Kingdom, giving concerts in the major London concert halls, as well as at numerous festivals around the country. The choir also performs with instrumental groups such as the European Baroque Orchestra and the Dmitri Ensemble. In January 2016 it gave the world premiere of Green Mass, composed by Alexander Raskatov, in the Royal Festival Hall along with the London Philharmonic Orchestra conducted by Vladimir Jurowski. The Choir of Clare College, Cambridge has recorded extensively, now exclusively for the Harmonia Mundi USA label. Releases on this label include Veni Emmanuel: Music for Advent, Stabat Mater Dolorosa: Music for Passiontide and a recording of selected works by Imogen Holst. The choir has also begun live streaming of some of its evening services from the chapel. The choir often tours externally, usually between university terms. The choir has an extensive and diverse repertoire. Many composers have been commissioned to write for the choir, including Sir John Tavener, Jonathan Dove, Herbert Howells, Tarik O'Regan, John Rutter, Giles Swayne (the college's composer in residence) and James Whitbourn.